I need to start this post off with a confession… I am not that into art. I just don’t get art or how people pay thousands of dollars for something that looks like my three year old made. 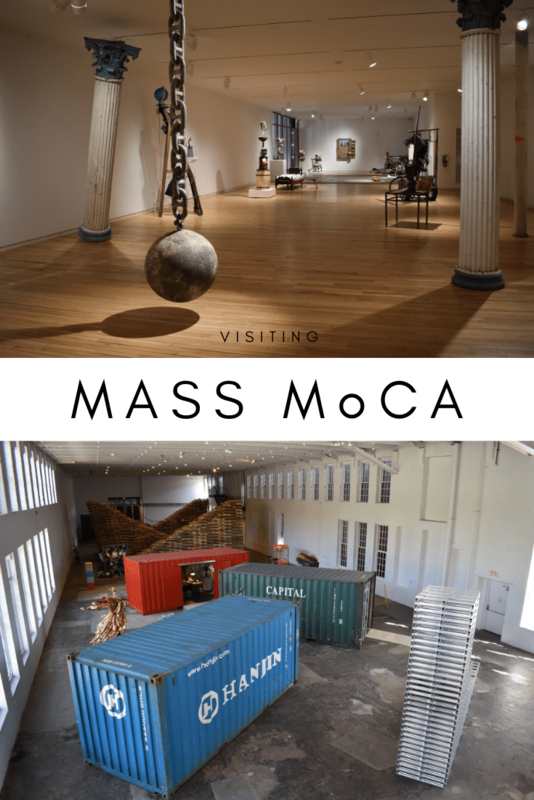 With that said, even I was impressed by the Mass MoCA. I have never been to a museum like it. The art is housed in renovated warehouses and it is huge. I walked from building to building and was pretty awe struck by each installation I stumbled upon. You will want to give yourself a minimum of two hours here. Note that no backpacks are allowed but lockers are available. One of the most poignant exhibits was called The War Room where artist Jenny Holzer has displayed blown up copies of declassified government documents. These files list interrogation tactics used at Guantanamo Bay, many of which ended in the death of the prisoner. I was pretty blown away to see how many people were killed after being tortured in these facilities. This gallery is meant to reflect war and its aftermath from military and civilian perspectives, and represents the voices of the victims and the perpetrators of violence. All of that is far too heavy for children to bare. But there is an incredible Kid Space that is free for children and families. Let their imaginations run wild at the Art Bar while they are feeling inspired by all of the unique contemporary art they have just viewed. There is also a very nice cafe with coffee and ice cream if you need to refuel. On your way out, don’t miss the custom desserts at Gramercy Bistro. It is a wonderful place to eat a nice meal and the dessert is a work of art in itself! All of that walking tired me out and I was so happy to find a microbrewery called Bright Ideas Brewing just outside. I sat out in the sun and drank their locally malted grains and hops grown in Berkshire valley. It was a great way to end a day of exploring the Mass MoCA. I stayed at an inn right around the corner called The Porches and it was so amazing, I wrote an entire post on it which you can read here.